Our days of operation have changed! Spending a Sunday at the museum is a great way to wrap up any weekend. Roam through 45,000 square feet & explore your California roots as you marvel at iron that dates back more than 100 years. 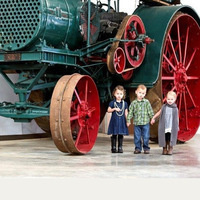 Families & kids of all ages are invited to experience kid's exhibits featuring a Caterpillar 10, tractor pits & a fleet of pedal tractors. After all that pedaling & exploring we encourage you to take a stroll in our courtyard where you can enjoy a snack or picnic lunch on the lawn. General Admission is $10 with discounts for seniors, students, children & groups. Members are free. We encourage you to become a member & visit as often as you would like. In 45,000 square feet there is always something new to explore & experience.